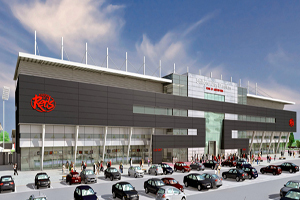 Salford City Stadium, the home of the Salford City Reds rugby team, is opening a new stadium in January next year, which will provide space and facilities for corporate groups. A range of flexible suites and twelve hospitality boxes with audio visual equipment will be available for events for between 10-750 guests and four outdoor concourse areas can also be used for team-building events and exhibitions. Travel to the venue via a private helicopter charter service will also be available for corporate groups. The stadium is adjacent to the M60 motorway and close to the Trafford Centre and City Airport.